One of the common features in many communities in Europe, the British Isles and rural Canada, is the churchyard cemetery. There is a long tradition of churches caring for the family from the cradle to the grave. Funerals and the whole burial process have become increasingly commercial, and many find it impersonal. Windsor Park United Church was challenged to consider an alternative that better reflects our theology of ministry at the time of death. 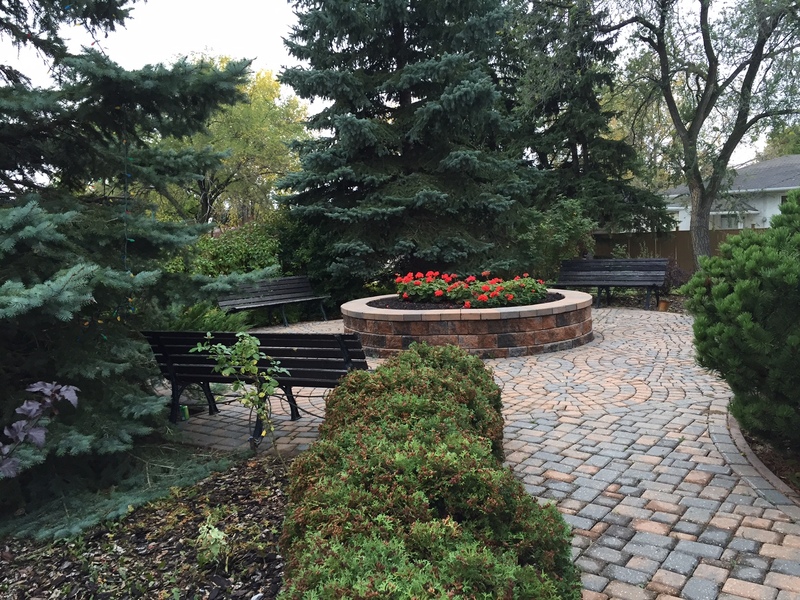 The Memorial Garden was conceived and designed by members of the congregation. The names of those persons whose ashes have been interred are located on plaques inside the church sanctuary. In return for the donation to the fund, the ashes will be interred in the Garden. Your donation also supports the perpetual care of the garden. A small plaque, showing the name of the deceased, year of birth and death, is mounted on a suitable common memorial displayed in the Church. As well, If requested, a suitable memorial will be included as part of the Memorial Garden information on the web site. There is no provision for prepayment of Memorial Garden use. The trust and record keeping implications involved are too complicated for the Church to undertake at this time. We recommend you take a few minutes to discuss your funeral arrangements with the minister. Proposed funeral wishes should be reviewed with your spouse, children and anyone else who might be involved at the time of your death. It is also a good idea to write a short note outlining your wishes and place it in the hands of the person who will be making arrangements on your behalf. And the people of Windsor Park United Church, grateful for the support of travelers on the journey of faith, grateful for our heritage and the dedication of those who carried the vision of this Christian community, offer themselves anew to the worship and service of God, through Jesus Christ now and always. Jeremiah 31:10-14 Hear the word of the Lord, O nations, and declare it in the coastlands far away; say, “He who scattered Israel will gather him, and will keep him as a shepherd a flock.” For the Lord has ransomed Jacob, and has redeemed him from hands too strong for him. They shall come and sing aloud on the height of Zion, and they shall be radiant over the goodness of the Lord, over the grain, the wine, and the oil, and over the young of the flock and the herd; their life shall become like a watered garden, and they shall never languish again. Then shall the young women rejoice in the dance, and the young men and the old shall be merry. I will turn their mourning into joy, I will comfort them, and give them gladness for sorrow. I will give the priests their fill of fatness, and my people shall be satisfied with my bounty, says the Lord. Psalm 6:1-3 Where has your beloved gone, O fairest among women? Which way has your beloved turned, that we may seek him with you? My beloved has gone down to his garden, to the beds of spices, to pasture his flock in the gardens, and to gather lilies. I am my beloved’s and my beloved is mine; he pastures his flock among the lilies. Where did the concept of a Memorial Garden for Windsor Park United Church have its beginning? Three years ago, Neil Bardal, of Bardal Funeral Homes, came to speak to the AOTS Men’s Club. Two points stood out from a very interesting and informative address. First, Mr. Bardal expressed concern that church members be enabled, and indeed encouraged, to contribute to their churches at time of death. Secondly, he suggested that a Memorial Garden , adjacent to the church, would be an ideal way for the church to further serve their members. Your Official Board considered the idea and established a committee to initiate the process. The committee came up with preliminary drawings and subsequently estimates were obtained. Various other successful projects by various denominations were explored and/or visited in southern Ontario, Edmonton, Winnipeg, Atlanta, Georgia and, yes, by Sharon in Africa. The proposal was taken to an Annual meeting where it received strong approval. On behalf of everyone at Windsor Park, I would like to thank the original committee who did all the spade work – Allan Hinds, George Baker, Bill Belsham, and Bob James. Also, Len Kernaghan and his current Administrative Support Council deserve a special mention for their diligence in arranging the final contracts and bringing this project to fruition. Barbara Znidarsic, another member of our congregation, was the architect for the final project, and what you see here today is her conception. Thank you also to those who have contributed financially toward the initial capital cost of construction. And last but not least, we can’t forget our conscience and leader, Sharon Wilson, who has quietly been the quarterback behind this project. If you have traveled Europe and the British Isles and rural Canada, you will have noted that one of the common features, regardless of size, is the churchyard cemetery. There is a long tradition of caring for the family from the cradle to the grave. Funerals and the whole burial process have become increasingly commercial, and many find it expensive, impersonal and profit oriented. As a church we are challenged to consider an alternative that better reflects our theology of ministry at the time of death. The dedication of this Garden today allows us to fulfill our call to minister to the families of our church, from the cradle to the grave. The Garden will be a place of beauty and peaceful remembrance in the shadow of our Church home. And lastly, the Garden will be a constant reminder of our community, which upholds us in life and in death. We now, the people of this church, grateful for the support of travelers on the journey of faith, grateful for our heritage and the dedication of those who carried the vision of this Christian community, offer ourselves anew to the worship and service of God, through Jesus Christ now and always. Amen. This garden represents a huge act of faith by the people of Windsor Park United Church. It proclaims our caring for one another, our hope of bringing peace and justice into the lives of all people. It adds beauty to a world that is too often stark and unwelcoming. This garden says, “come”. Let us receive with grace the people who find their way here. May this be a place where the gift of laughter will rise about our troubles, where treasured stories will be shared to make us wiser, where the pain of loss will be embraced with arms of hope and trust. Let us strive, always, to be God’s servants healing and helping our world in any way we can. Go in peace. Amen.